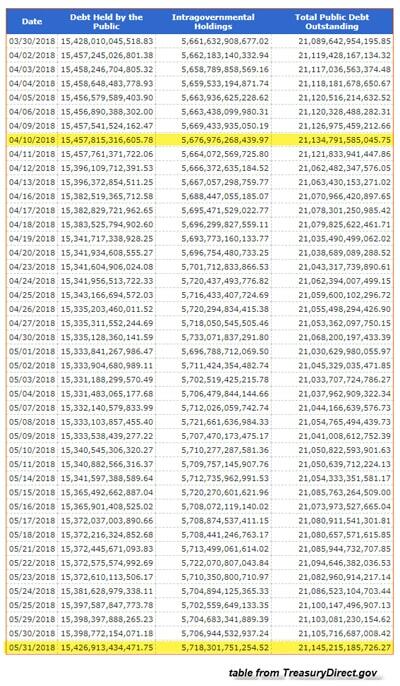 Thus, the extra $26 billion paid by the U.S. Treasury to service its debt would have purchased the 1+ billion ounces of silver held in the COMEX (270 million oz) and all the Global Silver ETFs. And, this would include the 138 million oz of silver supposedly stored at the JP Morgan vaults. However, with the remaining $10 billion ($26 billion minus $16 billion), the U.S. government could have also purchased all the American Eagle silver bullion coins minted since 1987. According to my figures, the U.S. mint sold over 510 million Silver Eagles from 1987-2018. If we give a value of $20 for each, that would be roughly $10.5 billion. And remember, this is just the ADDITIONAL interest expense paid from Oct-April to service the massive U.S. public debt. If interest rates continue to stay the same or rise for the remainder of the fiscal year, the U.S. government will likely pay between $45-50 billion more in 2018 to service its debt. Lastly, I am quite surprised by some of the analysis coming from the precious metals community. I will be writing about this at length in a new article, but it’s quite frustrating to see precious metals analysts totally disregard energy in their work or change the facts to promote a certain ideology. For example, Bix Weir recently posted a new video on the “10 Reasons to own Silver.” While I agree with some of the reasons he states to own silver, I was quite stunned to see Mr. Weir state in his 8th Reason was due to a 1/1 Ratio of Gold to Silver. Bix remarked that there were about 6 billion ounces of above ground gold and silver, so this One-to-One ratio meant that silver was undervalued. I get it. However, Bix has been claiming that the world has millions of tons of gold in the world. But if he states there are 6 billion oz of gold above ground, that is roughly 187,000 metric tons… a figure that I have reported to be accurate for several years.